Thousands of Gulf Coast fisherman face a disaster of financial ruin because of the BP Gulf of Mexico oil spill. Yesterday, the catastrophe entered its third month and by all estimates will be affecting the Gulf Coast for years to come and many say the stress is worse than after Hurricane Katrina. Then, they were able to go back to work despite the ruin the hurricane left in its wake. Now, this is impossible as nobody knows when the waters will reopen, especially since the well has yet to be permanently sealed. Gone are their livelihoods, their routines, any sense of security once held. Many of the residents were independent, used to making their own decisions and running their own lives, but this has all now been replaced by a dependence on British Petroleum, either being hired to do cleanup or waiting for checks to come, their date of arrival as uncertain as anything else these past three months. Social Services around the Gulf Coast are beginning to see a trickle of people coming for help, and many in the mental health field recognize that in disaster zones, need often comes in clusters. As one person seeks help in a community, this will often open doors to others and soon the need quickly outweighs the supply. This is especially pertinent in locations like the Gulf Coast, where “unfortunately the people most affected, shrimpers and fisherman, are not people who traditionally seek mental health services,” says Jeffery Bennet, the executive director of the Gulf Coast Mental Health Center in Gulfport, “They’re kind of tough characters, and look at being depressed or not being able to handle their own problems as weakness.” Oftentimes, it takes the suicide of an acquaintance or friend for people to recognize the seriousness of their own depression. One counseling center in Alabama saw no people asking for services one day, but then two days after the death of William Kruse, five people came in saying they needed help because of the spill and as news of his death spread east to Florida, one agency publicized their crisis line and several calls started coming in daily. 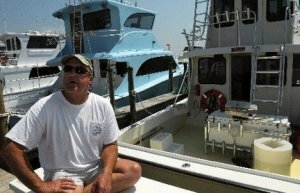 John Ziegler, a spokesman for mental health services in Alabama said counselors have gone out to marinas, docks and other places frequented by fisherman. “They have had people break down and weep,” he said, “They have had people share some of their deepest feelings about their future and how they’re feeling now that things seem imminent.” The Louisiana Department of Health and Hospital’s (DHH) crisis counseling teams have also been on the docks, engaging and counseling more than 2,000 individuals. Community based organizations such as LEAN, the Louisiana Environmental Action Network spend long days out, seeking to help those in need while Kindra Arnesen herself recently set up the Wives of Commercial Fisherman Network to respond to pressures in her community. The outreach providers all say many Gulf Coast residents are reporting similar experiences and symptoms: depression, worries about the future, feelings of failure and a loss of identity. Recently, a friend of Kindra Arnesen told her he was so upset about his failure to get hired by BP’s cleanup crews he was considering suicide. And this is the fear, left untreated, the frustration, depression, grief and anger can quickly develop into behavioral health problems that lead to the breakdown of the familial structures, domestic violence, substance abuse and suicidal thinking. What is needed in the Gulf Coast is outreach. People don’t seek mental health assistance for many reasons. They fear being stigmatized by friends or families. They don’t want to appear weak to those who depend upon them for support. They don’t have the time, they’ll take care of that later, they don’t know where to go or who to ask. Outreach into the communities help to break down these barriers. A golden rule of social work: if people aren’t coming to you for services, bring the services to them. Outreach, and more outreach is crucial in these next few months to promote discussion, the communication between people of common experience so those in need can begin healing the psyches that continue to be battered with each new wave of oil. The economies of the Gulf Coasts states have been shaken up by the recession impacting the rest of the country, budgets are running in the red, deficits extend city by city, county by county, and outreach costs money. “There is a dire need to access greater funding that can be used to serve the immediate and long-term needs of the growing vulnerable population,” Father Snyder says. The requests are being made, but is British Petroleum listening? The Lousiana DHH have requested $10 million dollars to support six months of continued outreach activities for their Louisiana Spirit Program to provide mental health services to those affected by the oil spill. Mississippi has also asked for $10 million dollars and Florida has asked too. Alabama has requested $5.7 million dollars so they can get more counselors in the field over the first three months and an additional $20 million dollars per year for the next five years to sustain outreach and work with people in need to find real solutions and provide professional care. Justin Saia, a BP spokesman said recently each state’s proposal is going through the “review process” but three months in, no decisions have been made on any of the requests. This answer is unsatisfactory; the need is present now, growing stronger and the people attempting to provide services are frustrated at the lack of response from British Petroleum. After requests made on May 28th and June 28th, the Louisiana DHH advised the US Department of Health and Human Services in a July 9th letter they have requested $10 million dollars from BP without receiving a formal reply. Louisiana Health Department spokeswoman, Lisa Faust said following the release of Fitzpatrick’s letter, BP finally made its first acknowledgment of their request, by fax, yet no money has been promised. The Louisiana Health Department has since called again, but not yet received a response. There is reason for this lack of response. In a recent article in “On the Hill,” it is noted that “Louisiana’s demands have significant future implications for disputes over BP’s liability in the spill. Much like claims for damage from bodily injury, mental health is not covered under the oil pollution act, the 1990 federal law that holds oil companies liable for “removal costs and damages resulting from an incident.” BP’s response to the request could be seen as a precedent in a new area. BP would appear to be protecting their bottom line, again. Helplessness and uncertainty is to be had in the Gulf Coast. It is being felt by the fisherman, the oil rig workers suffering under the moratorium and the families of everyone associated with the industries who suddenly find themselves and their way of life sinking amongst the slicks of oil. Families are being separated. Pressures are increasing. Stress, anxiety, depression are all being felt and experienced and people need the options outreach could provide. Uncertainty is also being felt by non-profits and mental health agencies who want to be there for the Gulf, to offer services, but the state money is quickly running out and more counselors are needed. The Gulf Coast is a proud community, filled with self-made people who enjoy a tough job on the water. Many suffered through Katrina and were made promises by one president, only to be let down. Now they are in need due to the malfeasance of British Petroleum. They didn’t ask for this. They obviously didn’t want this, and we can’t allow British Petroleum to let them down again. Keep pressure on the bastards. Next Post Rigs, ships moving away from Gulf Oil Spill Site as tropical Storm Bonnie Approaches…well cap stays on?